Sparkle Spa: Bling It On! 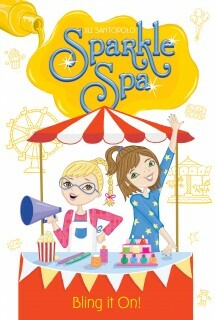 The Sparkle Spa nail salon relocates for Carnival Day—but can the Tanner sisters salvage the situation when a not-so-fun problem appears? It’s Carnival Day at Auden Elementary School and Aly and Brooke are thrilled to set up a glittering Sparkle Spa booth for festive manicures. But what starts off all fun and games soon ends up in unpolished disaster! Can the girls find a way to repair the damage in time to enjoy the day?